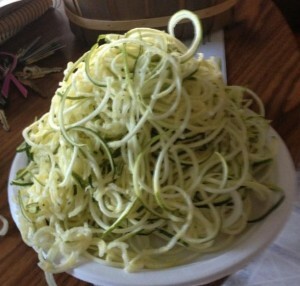 The big question is How to Shred Zucchini Pasta easily for fun low-carb meals and side dishes. There are two easy ways! The easiest, safest and most popular option is to use a Paderno Spiral Vegetable Slicer which ranks #1 on Amazon in Kitchen & Housewares. It’s only #34.81 with FREE shipping. 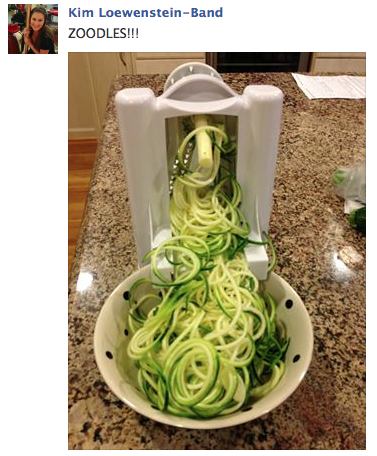 This handy little gadget makes the coolest looking Zucchini Pasta ever – as you can see from Kim and Emily’s photos. You can also shred cabbage, make beautiful garnishments, create cucumber swirls to jazz up your salads, and… well, the ideas are endless! “Shred Zucchini Pasta in SECONDS!!!! You really will think you are eating a big bowl of pasta except you feel totally healthy and good after! 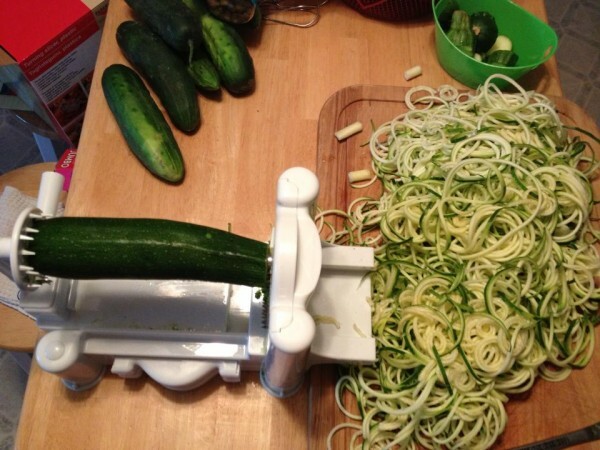 So you have super cool “Zoodles” aka Zucchini Pasta… now what? So now you know how to shred zucchini pasta, and have a few delicious ideas for using “Zoodles” in your low carb recipes. If you have a favorite method for shredding zucchini, or a fun Zoodle recipe, share it with us in the comments below! This entry was posted in Kitchen Talk and tagged recipes, reviews. Bookmark the permalink. 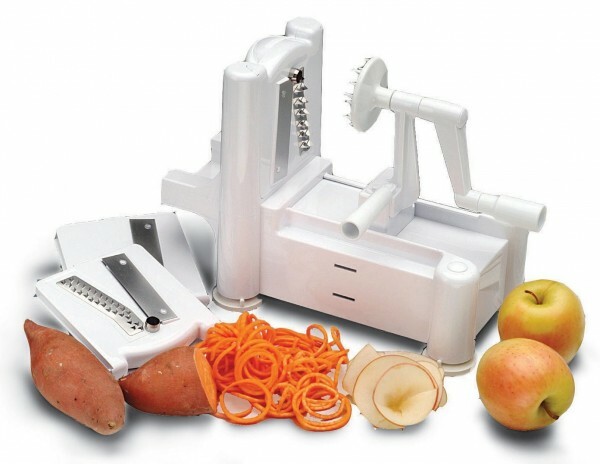 I’ve seen those vegetable slicers and I want one for myself! I might try using the second method though because as far as I know they don’t sell those slicers in Finland…. The seasoning instructions are good too. I use the Paderna model, too. It is awesome! The pic above is what I was in the process of getting from just one zucchini. I need things to be easy, quick and of course delic! If I am using this tool several times a week, then anyone can easily do this! I like the idea, but I just don’t need another gadget! I might try the regular grater method first. 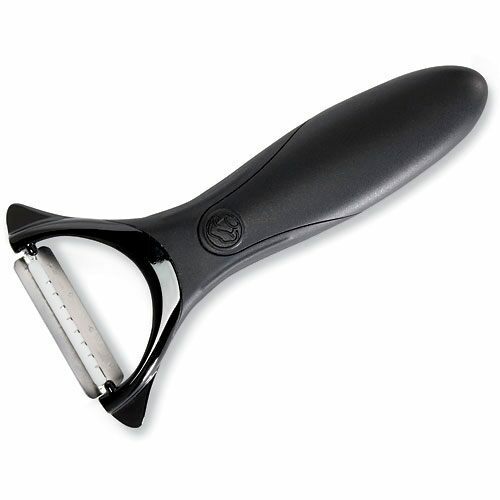 Pampered Chef has a Serrated Peeler, Item Number 1072 for $9.00. It works great for Zoodles!!. I am going to get this and try it out. Zoodles, here we come. which attachment is it ? I bought the Veggetti Spiral Veggy Cutter, I ordered it at Amazon, just tried it. Man, what a treat! Thank you for the tip. What do you think about using Zucchini “spaghetti” in Shrimp Fettucinni? I want to make it for a party and want to avoid the noodles. I was thinking about spaghetti squash, Zucchini would be cheaper. Sounds delicious, Clarise! 🙂 I don’t really like spaghetti squash, and find it difficult to work with. Just don’t overcook your zoodles – steam them – and it should be fabulous! I just got one for Christmas but I haven’t eaten noodles in so long…. I don’t know what to make them with! Post some recipes for what to do with these “noodles”! Are you in my low carb challenge group? If so, this thread has TONS of ideas: https://www.facebook.com/groups/lowcarbchallenge/permalink/1191163794244982/ Enjoy!